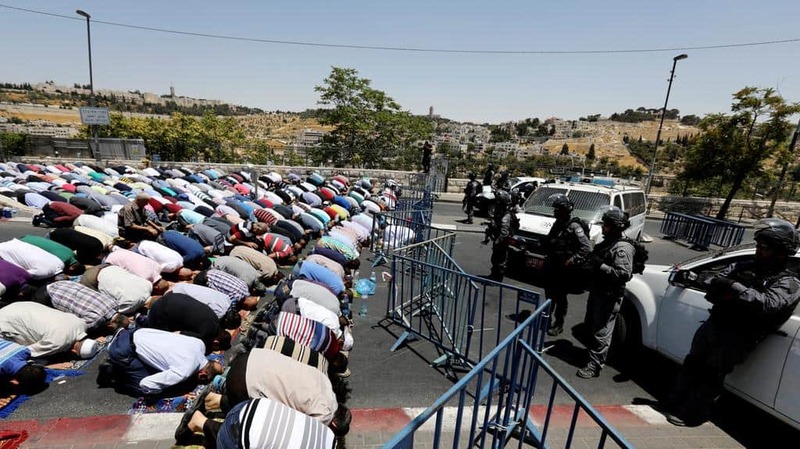 Palestinian Muslims pray outside of Jerusalem´s old city while Israeli police stand guard. Fifty years of a peace agreement that will never come to fruition. This is the reality of Israeli apartheid in Palestine. What is evident and very much alive is Palestinian resistance. The Israeli regime destroys homes by bulldozing, confiscates and razes agricultural lands, restricts basic movement, prevents electrical services, blockades water, routinely practices arbitrary arrests, imprisons and tortures innocent children regularly, and encloses Palestinians behind an apartheid wall/blockade built to force inhumane and substandard conditions upon the children, women and men that inhabit the West Bank. While committing these atrocities, Israeli continues to build illegal settlements on land stolen from Palestinians. Violent and deadly co-existence has been the only story told of Israelis and Palestinians, with the latter being the perpetual victims. Recent events brought forth the fragile reality of Palestinian existence when three young Palestinian males were killed by Israeli police after two of their officers were killed at Al Aqsa Mosque in Jerusalem. The Palestinians allegedly smuggled weapons into the mosque complex at an earlier date. All three men were Israeli citizens hailing from one of northern Israel’s Arab villages. It is alleged that at least one of the three believed that Israel was taking control of the mosque. In response to the attack, the Israeli government shut down Al Aqsa and disallowed worshippers entrance. This escalated further tensions as swarms of police were deployed to prevent worshippers from entering the holy sites. Metal detectors were installed and police dogs were used to help establish control and dominance over the people. The flashpoint metal detectors have now been removed from Al Aqsa, one of Islam’s holiest sites, after drawing angry protest from Palestinian Muslims and Christians. Members of the international community are hailing the removal of the metal detectors as a positive step toward conciliation, but in reality, it is another Israeli smokescreen as the Zionist government has already made it clear that the metal detectors will be replaced with another form of surveillance. This is Israel, and this is the reality of Palestinians living under an apartheid regime. Irrespective of how many times their homes are demolished, their crops destroyed, or their children and elderly murdered, they persevere. Palestinians continue to remember that there is no God but Almighty Allah and that Muhammad, Jesus and Moses (peace be upon them) are His messengers. They believe in the Almighty’s promise and know that after every difficulty comes relief. Until then, Palestinians continue to resist apartheid and oppression while living under some of the harshest conditions in the world.